I didn’t use yogurt chips in these cookies, but I did add cream cheese to the dough! The cream cheese replaces some of the butter in the cookie, and gives the cookies a subtle tang. More importantly, the cream cheese also adds a certain soft bite to the cookie that you can’t get with just butter, flour, and sugar. I highly recommend using full fat cream cheese and not reduced fat cream cheese. Also, please don’t use whipped cream cheese, as the air that’s incorporated into it will throw off the measurements. I know some folks are averse to artificial food colorings. Sadly, because of the chemistry of this particular cookie dough, there’s no way to use natural food coloring. Beets (a common natural red food coloring substitute) will turn brown when baked in these cookies as well as throw off the balance of the dough because of the moisture. Other commercially available natural food colorings will also turn brown in the high heat of the oven. 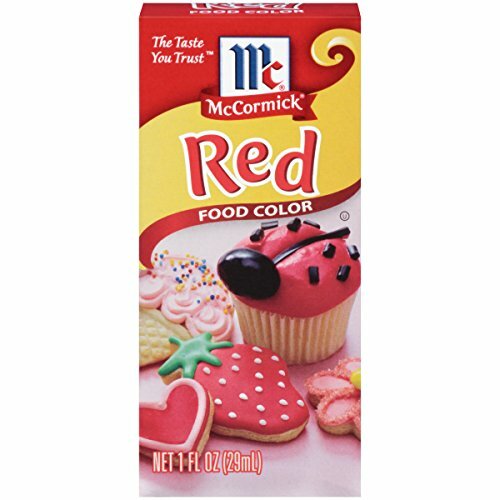 My go-to choice for food coloring is often just the McCormick brand of liquid food coloring, the type you can get at most grocery stores. A lot of professional bakers use food coloring gels that are more intense in color. But again, as I stated before, I often don’t like to source my ingredients from specialty stores or online. McCormick’s is what I use and how I tested this cookie, using a single tablespoon of red food coloring in a recipe that yields 36 cookies. If you want a more vivid red color, you can increase the food coloring up to 2 tablespoons. If you want to use less, you can reduce it down to 1 teaspoon, knowing the cookies will come out dark burgundy, with just a tinge of red in them. 2 Begin making the batter: Place the butter, cream cheese, both sugars, baking soda, salt, and vanilla extract in the bowl of a stand mixer fitted with a paddle attachment. Mix on medium speed until the mixture is creamy, uniform in color, and clings to the side of the bowl, about 1 to 2 minutes. 4 Add the flour and cocoa powder: Mix on low until the dry ingredients are just absorbed. Hello! All photos and content are copyright protected. Please do not use our photos without prior written permission. If you wish to republish this recipe, please rewrite the recipe in your own unique words and link back to Red Velvet Cookies on Simply Recipes. Thank you! Made a batch of these over the weekend. Had to bring them in to work to share with the crew so I wouldn’t eat the whole batch in one sitting. These are some seriously good cookies! May use them for Christmas and swap out the white chocolate on top with some green M&M’s. Even for a person who doesn’t like red velvet, these were (without a doubt) worthy of 5 stars! I loved how chewy they were and how they stayed that way for days in my cookie jar. My son, who loves red velvet, said these were a hit! I have to agree!